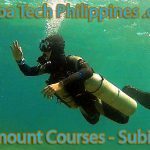 Scuba buoyancy plays an important role in all the phases of a scuba dive. 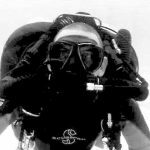 In this article, we look in detail at particular elements of a scuba dive, with an emphasis on the impact of scuba buoyancy control on the safety and enjoyment of the dive. 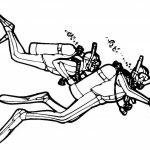 Upon descent, it is important that the diver fully empties their BCD, exhales and ensures that they are not instinctively fining or sculling their hands. These are the most common causes that lead to divers mistakenly over-weighting themselves. The diver has to descend a few meters before the increasing pressure will begin to have a noticeable impact on reducing their overall buoyancy (compression of their exposure suit). Until this point, the diver should refrain from a large inhalation, which could float them back to the surface. Likewise, divers who are apprehensive will often breathe rapidly. This creates a more constant volume of air in the lungs that can hamper their attempt to descend. Exhale deeply and maintain slow, shallow breathing for the first couple of meters to prevent re-ascent. 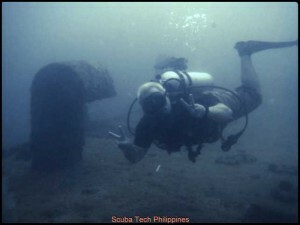 Divers should generally aim to pause their descent at around 5m. 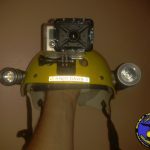 This enables a buddy team to conduct a brief visual inspection of each other (often called a ‘bubble check’), whilst also ensuring that they begin their descent in a controlled manner. 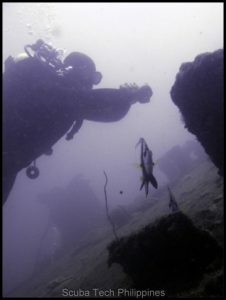 Some divers chose to conduct additional checks at this stage – such as confirming the water resistance of underwater cameras, that dive computers have entered ‘dive mode’ or ensuring that ‘long hose’ primary regulators have not been unintentionally routed/trapped under other equipment (i.e. stage cylinders). 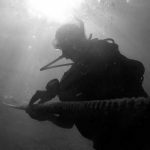 As the diver continues to descend, the compression of their exposure suit and other buoyant materials in their equipment (i.e. BCD padding etc) will be leading to increasingly negative buoyancy. 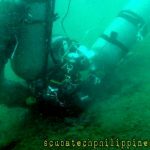 Air must be added regularly to the BCD to ensure that neutral buoyancy is maintained. It is not advisable to ‘plummet’ negatively on the descent, and then expect to add air shortly before the bottom to arrest that descent. 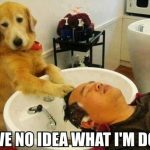 Should the diver, or their buddy, experience any problems on the descent (such as ear squeeze) then they need to be able to instantly achieve neutral buoyancy, hover and resolve the problem. 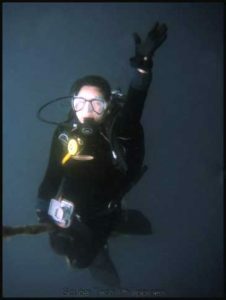 This is only possible if the diver is descending using near-neutral buoyancy so that the descent can immediately be arrested by deeper breathing/lung control. 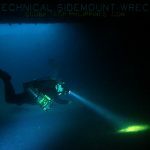 Whilst the descent should begin in a vertical position, the diver should aim to transition into a horizontal trim position after a few meters. 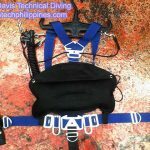 The horizontal (‘free-fall’) position increases water resistance (reducing/limiting descent speed) and encourages the diver to use proper buoyancy control – rather than compensating by fining upwards – to control their descent. This, in turn, prevents the common scenario of a badly trained diver ‘fining’ into the bottom and disturbing silt/sand/mud material as they reach the bottom. 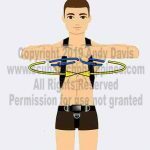 Being horizontal also encourages greater buddy awareness and the ability to immediately transition from a vertical descent into horizontal movement once the target depth is reached. The diver should reach their bottom depth with neutral buoyancy. To confirm this, spend a few seconds simply hovering still, whilst breathing normally. This will confirm that you do have effective neutral buoyancy. 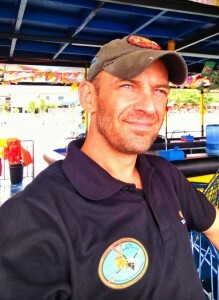 The diver can confirm their weighting by assessing/feeling the volume of air in their BCD. They have only added air to compensate for the reduction in buoyancy from their scuba kit caused by material compression on the descent. It is a like-for-like exchange of buoyancy. As they descend, their wetsuit compresses and they have added an equivalent volume of air to the BCD. 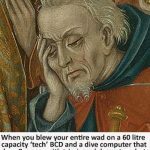 There should never be an ‘excessive’ volume of air in the BCD. A diver’s common sense should inform them if that volume is ‘excessive’ in relation to the type of exposure suit they are wearing. A diver wearing only shorts and a rash guard should require virtually no air in their BCD during the dive. A 3mm shorty neoprene suit will require a slight amount of air. In contrast, a cold-water diver in a 14mm full suit, with hood, gloves and thick booties might require considerably more air in their BCD. Whilst travelling at a constant depth, the diver should not need to adjust their buoyancy. Small changes in depth level can be attained by breathe control/lung volume variation. The need to make constant adjustments to BCD volume for every minor depth fluctuation strongly indicates over-weighting. Flat, horizontal trim prevents water movement across/into the body from providing ‘lift’ to the diver. 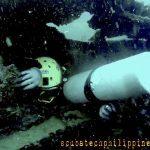 This can be a particular problem in high-current dives. The diver will travel in the direction that they are fining. If their trim is angled head-up/feet-down, then they will travel upwards in the water column. The steeper the angle, the more lift they will create. The only factor that will counteract that lift, is negative buoyancy. 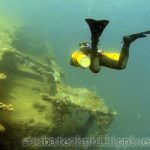 It is easy to be mistake propulsion/lift as excessive buoyancy, or maintenance of depth, through fining, as neutral buoyancy – when actually the diver is negatively buoyant. 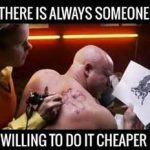 When the diver stops fining, they will sink. Proper trim and occasional confirmation of buoyancy (by statically hovering) will prevent this miscalculation. Test and confirm your buoyancy occasionally during the dive, by closing your eyes, relaxing, floating and breathing naturally for 10 seconds. Any flaws in your buoyancy will be exposed when you re-open your eyes. If the diver is neutrally buoyant on the bottom, then only a slightly exaggerated (deeper/longer) inhalation will be sufficient to begin their ascent. The diver should ensure that they do not exceed an ascent rate of 9m per minute until their safety stop. From the safety stop (5m) to the surface should take 45-60 seconds. This is a ‘best practice’ technique that accounts for the largest percentage pressure differential in shallower water. 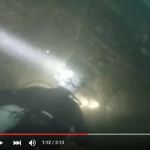 Divers should never ‘pop up’ quickly from their safety stop. 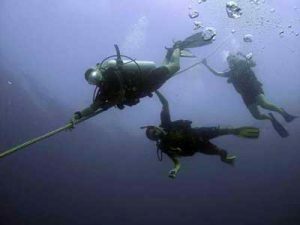 The diver should ensure that they match and maintain depth and ascent rate with their buddy. 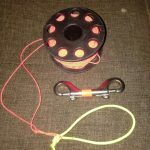 This enables a timely reaction and assistance to any problems that may occur during the final stage of the dive. 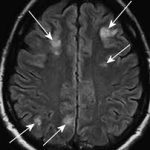 The body is at its highest nitrogen loading – the most risk of decompression sickness. The scuba cylinder is at its lowest volume of air – the most risk of running out of air, plus reduced buoyancy due to decreased air weight in the cylinder. The air contained in the divers BCD and equipment (wetsuit buoyancy) is continually expanding as they get shallower. 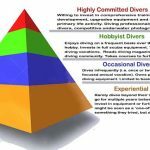 This is the time when divers are at the greatest risk of an uncontrolled/unintended ascent – and also the time when the medical repercussions of such an ascent are also greatest. Be vigilant and focused on the ascent. Regularly make ‘micro-stops’ on your ascent. This helps you gauge your ascent speed and also ensures that you are confirming your buoyancy control throughout that process. A diver should be able to arrest their ascent at will, using breathing control. Ensure that you can. Arrest an uncontrolled ascent with an immediate deep exhalation and then breathing shallow/slow. 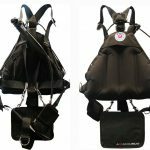 Follow this with a controlled dump of air from your BCD to re-achieve neutral buoyancy. Aim to return to neutral buoyancy – do not blindly dump air so that you lose all buoyancy control and begin to sink again. Over-correction often leads to a back-and-forth struggle between positive and negative buoyancy. Confirm your buoyancy with a short hover, breathing naturally, before resuming your ascent. Ensure that you are venting your BCD from the highest point; otherwise, some air may remain trapped inside it. Air will not exit your BCD if it is forced to travel downwards to exit. If you are ascending in a vertical position, then ensure your LPI is raised vertically above your head. If you are ascending in a horizontal position, then you will need to arch your back to gain sufficient LPI elevation – or utilize a dump valve in the BCD lower hip area (if it has one). 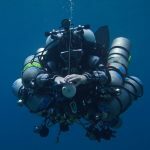 Whilst a safety stop may not be considered ‘mandatory’ according to your dive tables or dive computer, you should always endeavour to complete a 3 minute or longer stop as a prudent ‘best practice’ measure for mitigating decompression sickness. You should only abort a safety stop if other factors make it more prudent to reach the surface immediately; for instance, low-on-air scenarios, the strong current moving you away from your boat/shore or other medical issues. If you have been diving repeatedly and/or deeply, then consider extending your safety stop beyond the advised 3 minutes duration. 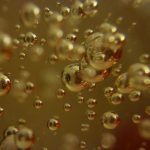 If you have sufficient air, and no other factors demand a timely rise to the surface, then ‘over-staying’ on a safety stop will maximize the off-gassing of nitrogen from your body. 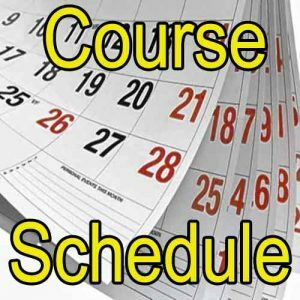 Use this time to practice your buoyancy. Hover. Practice core skills like mask clearing or air-sharing drills with your buddy. 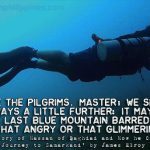 Review and share photos you have taken on your dive. Enjoy the zen-like trance of floating weightlessly. Use your safety stop, or other short breaks/hover when you reach shallow water, to observe the surface for boat traffic, to quickly check your time/depth/NDL and confirm you have no decompression obligation and also to pre-plan your final ascent and extraction back onto the boat/shore (especially in rough surface water conditions).